What a beautiful green wall addition to this Miami office! The vibrant plants are colorful, the structure adds dimension to the seating area and is artfully done. 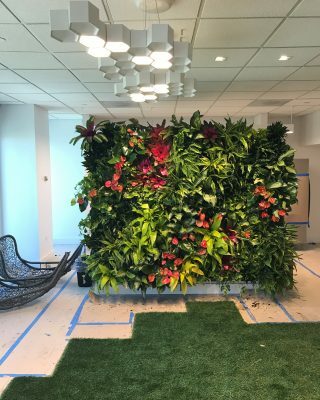 This is truly a masterpiece living wall! The remaining carpet looks like grass – hope the designer keeps the look when the carpet is reinstalled as it looks like a forest floor. Such a relaxing atmosphere while waiting for an appointment.